The usual answers to Ma Nishtanah (Why is this night different from all other nights?) are that we eat matzah and maror and we dip and lean at the Passover Seder. 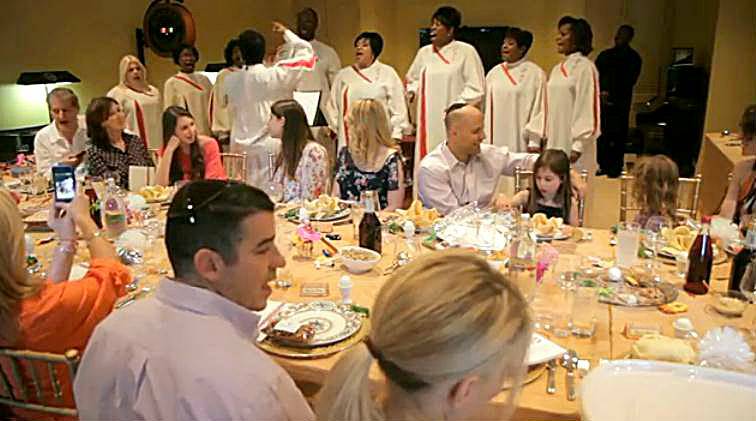 But at the home of the Pearlmans (we don't know them, but from the video below they seem to have a very large house and invite lots of people to their Seder) last year there was another answer to the question. What was different was that the many guests attending the Seder got a big surprise when nine members of a church choir descended the stairs to the dining room, started singing "Let My People Go," and launched into a medley of Passover and other familiar Jewish songs as the guests whipped out cellphone cameras to capture the scene. The video captures the Seder, including candle lighting, washing hands, and the search for the afikomen in the fully equipped exercise room. If you're wondering why the evening begins with the lighting of a Yahrzeit candle, so are we. I like the afikoman cup at the end, almost missed it. In order to light candles on the second night, they must be lit from a preexisting flame. So by lighting the yahrzeit candle prior to the candles on the first night, the yahrzeit candle will last at least 24 hours and be available for the second night.